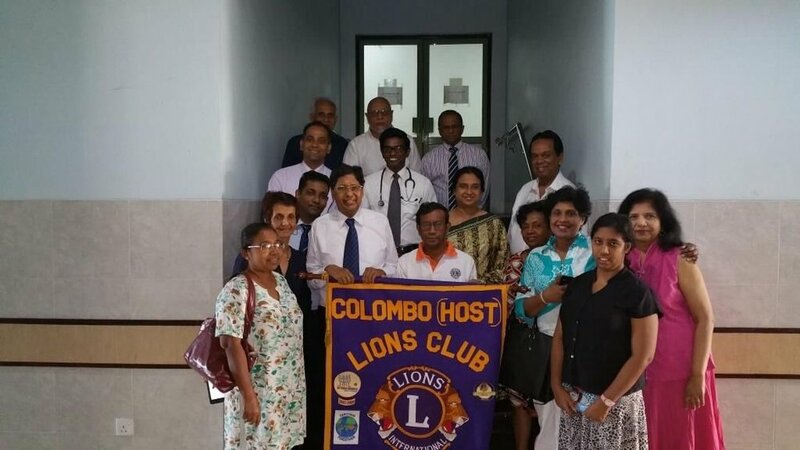 The Lions International Club of Sri Lanka has served the community for 58 years, assisting in the treatment of many underprivileged children with life threatening illness. The National Cancer Institute of Maharagama Cancer Hospital is a University-affiliated center where children with malignancies varying from leukemia to malignant tumors are treated. The children range in age from infants to teenagers. The children’s’ parents cannot afford the funds that are required for their treatment protocols. Many of these children also succumb to infections because the parents are unable to afford expensive antibiotics. Some of these children have had their limbs amputated due to complications from bone cancer. They are in need of prosthetic limbs, which cost more than the annual income of their families. 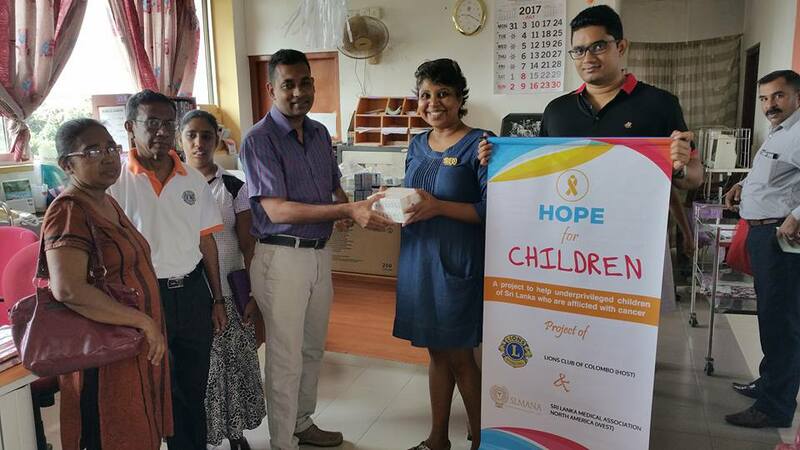 The Sri Lanka Medical Association North America–Western Region and the Lions International Club of Sri Lanka have joined to help these underprivileged children live cancer-free lives. 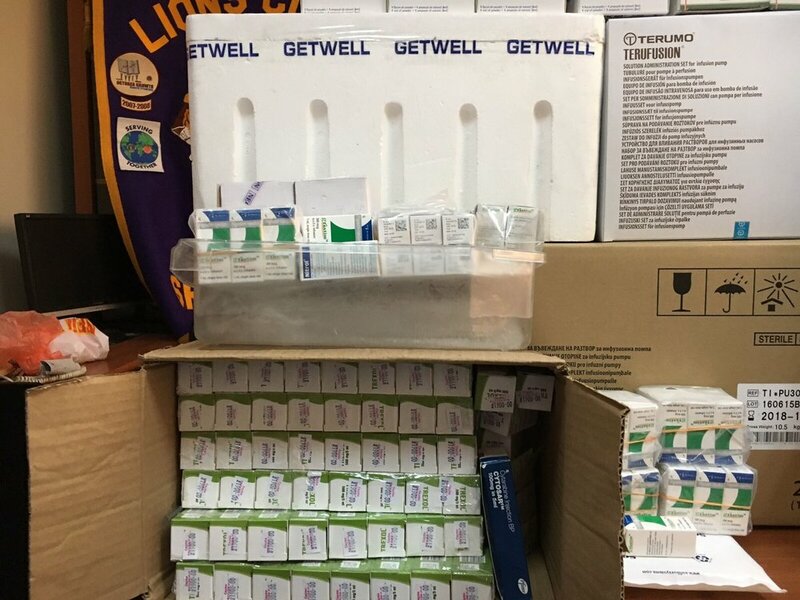 The Lions Club is launching the “HOPE FOR CHILDREN” project, which will procure the required medication, prosthetic limbs, and other necessary equipment. These will be purchased directly and distributed through the Medical Director in charge of the children’s unit at The National Cancer Institute of Maharagama Cancer Hospital. The Lions Club of Colombo is very thankful to the President, office bearers, and members of the Sri Lanka Medical Association – Western Region for pledging substantial financial support to carry out the project successfully. This project will not only help the children but also relieve their traumatized parents who can hardly afford their daily living, let alone purchase lifesaving drugs. In addition, young children whose limbs have been amputated would be able to receive adjustable artificial limbs, which will enable them to attend school and live normal lives. The SLMANA – Western Region Board of Directors and Committee members will coordinate and transfer financial assistance. Lion Lady Hiranya Jayalath will be the coordinator and liaison officer for the Lions Club of Colombo. We appeal to all kind-hearted and compassionate people to please help us make this worthy cause a success by donating towards this project that would help make cancer free lives for these children. Please join us in this humanitarian effort to realize the hopes, dreams and visions of healthy lives for the cancer-afflicted children through the “HOPE FOR CHILDREN” project. A dire need exists to create greater sensitivity and awareness of mental illness in Sri Lankan society, and to enhance Sri Lanka’s capacity to respond more effectively to mental disorders so that optimal mental health can be recognized in the country. Stigma associated with mental illness is highly prevalent in Sri Lanka communities, causing those suffering from mental illness and their families to endure prejudice, discrimination, and harassment as well as limited care. Beliefs that ‘Spirits,’ ‘Gods and Devils,’ or ’Paying for past mistakes' illustrates ignorance. Mentally ill family members are often hidden due to shame and fear that it would affect not only the individual but the entire family's social status, the person's marriage prospects, and employment opportunities for them and other family members. They are often viewed as violent, teased, punished, or starved and considered a burden to their families. Families often do not seek healthcare as mental illnesses may not be considered a priority, which, of course, compounds these issues . Approximately five to ten percent of the Sri Lanka population is thought to be suffering from mental illness requiring medical attention (Castillo 2009). Ten percent of all children between the ages of three and five and 25% of adults over the age of 65 are known to suffer from mental disorders. About 60,000 people suffer from schizophrenia at any given time. Annually, between 5,000 and 6,000 young people develop schizophrenia for the first time and about seventy percent of these cases are likely to develop into long term illnesses. Approximately 100,000 people suffer from manic depression, symptoms of which mostly appear before the age of 30. Also, 15% of the population is likely to develop depressive illness during their lifetime. As much as 20% of the population suffers from minor emotional problems that need care. Sri Lanka has one of the highest suicide rates in the world (Hendin, et al 2008; Siva 2010), and contributing factors may include the 30-year civil war and the devastating 2004 tsunami. Mental health care in Sri Lanka is plagued by poor funding, scarcity of trained human resources, and reliance on tertiary care. There is only one psychiatrist per 500,000 people (Siva 2010) and there is no formal care system in place. There is a dearth of therapists and mental health social workers (ATLAS project, WHO 2001). There are three mental hospitals in the Colombo environs “Lunatic Asylums,” with a general air of squalor, despair, and prison-like gates to restrain patients. These factors play a part in the treatment of the very ill but most patients need rehabilitation and counseling rather than medication and isolation. A community resource center at the National Council for Mental Health or NCMH also known as Sahanaya, a non-profit non-governmental organization, was established in 1982 and is a registered charity in Sri Lanka. Sahanaya is a unique and novel venture (and the first in Sri Lanka) and aims to increase much needed awareness of the prevalence, causes, stigma as well as effective treatment and care options that are available. The center will be an invaluable resource for the community at large to understand and appreciate mental illness better, and also for patients with mental illness and their families. This will be an essential adjunct to the care already available in Sri Lanka. The 2016 SLMANA - Western Region fundraiser collected funds to lay the groundwork for a community resource center at NCMH. Suggested projects would include renovation of an existing auditorium and the purchase of equipment for this center. NCMH staff will direct and oversee the project, gather and create material for display, and advertise and promote the project in order to create public interest and awareness. The fundraiser also raised additional funds for completing and sustaining the project. The imagined space would include an event and publications gallery, films, video clips, case studies, success stories and interesting facts for the public, including school children and law enforcement. One of the most important components and a major focus of this center will be a resource center where patients with mental illness and their families can gain access to the treatment and help they need. WHEN TREATED PROPERLY, THE RESILIENCE OF THE HUMAN MIND AND BODY IS REMARKABLE. LET’S REMOVE THE STIGMA THAT AFFECTS THE MOST HELPLESS AND UNFORTUNATE SECTOR OF HUMANITY. LET’S LIGHT THIS CANDLE TO CHANGE IGNORANCE AND NON-ACCEPTANCE INTO UNDERSTANDING AND TOLERANCE. Please take a moment to read about our Past Projects, too!